The white and yellow shades of vine, blossoms and leaf embossed evenly across the designer cotton diwan sets give a delicate and soft look. The innovative use of color pink also draws the attention of the visitor with its unique design concept. The intense dark pink shade on the hemlines would instantly grab the attention with its velvet looking appearance. The richness of velvet provides a luxurious flair to the royal furniture. The soft tones of pink at center portions exude a visually appealing contrast look to the linens. 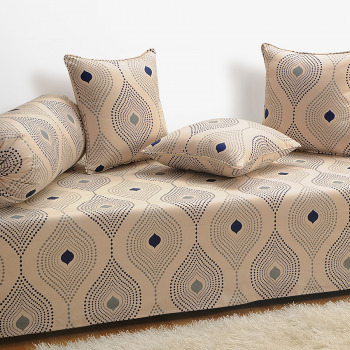 You may buy diwan set covers from online shopping store of Swayam to enjoy the cotton comfort. 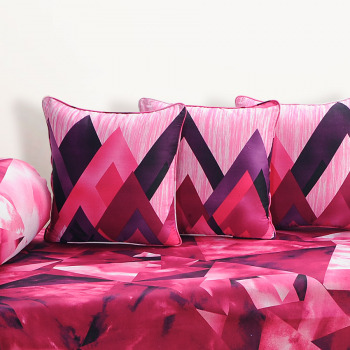 Cotton fabrics also ensure hygienic surrounding to the linens. Designer cotton diwan sets are reliable for 100% pay back in case when the customer has a change of mind within one month of delivery. Place an offer on website and pay money instantly through net banking. The 20 % discount makes it’s a pocket-friendly product to own.